We’ve developed a plan for Hurlstone Park that preserves the heritage character and provides opportunities for new homes and shops near the metro station. Have your say. Retain existing valued neighbourhood character. Protect additional heritage conservation areas. Improved streetscape along Crinan Street and station forecourt to reinvigorate the shopping area while retaining and enhancing its village-like character. 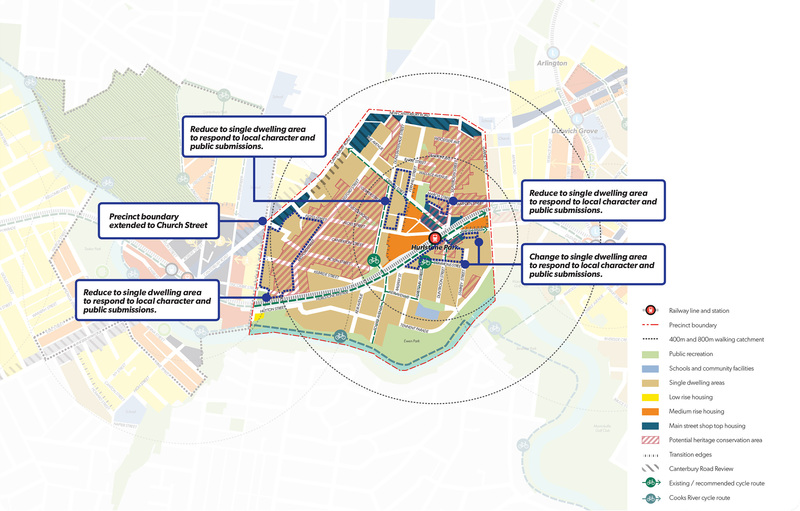 Improved public and active transport connections as a result of shared pedestrian/cycle paths and parks along the rail line. Encourage appropriate development for the surrounding low density neighbourhood character. This map shows the key changes that have been made to the Hurlstone Park Station Precinct Plan as a result of your feedback. Public Domain and Station Access Plan Sydney Metro will prepare a Public Domain and Station Access Plan for improved station design, accessibility and interchange with other modes of transport. The new metro station at Hurlstone Park will provide improved pedestrian and bicycle access. Heritage Conservation Canterbury Bankstown Council will finalise a planning proposal to protect newly identified heritage conservation areas across the Hurlstone Park Station Precinct. Hurlstone Park’s unique and fine-grain character and ‘village feel’ is important to you and needs to be preserved including in Duntroon Street and Hopetoun Street. New development needs to be better integrated with the surrounding lower density areas. Canterbury Road is preferred for new development. Including new open space in developments and protecting biodiversity is important to you. More detailed information on your feedback can be found in the Hurlstone Park Station Precinct Plan.